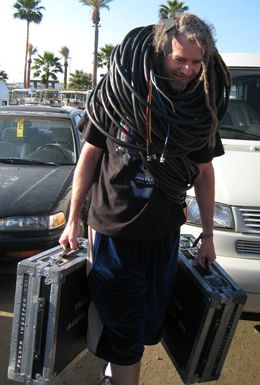 It’s now a week to the day since the start of the 2009 Coachella Festival, and I’m finally getting down to sorting notes, transferring pictures and video, trying to wrap the whole thing up in my head so I can file it away. Doing visuals at Coachella was fun as hell, and also the craziest and most seat-of-my-pants show I’ve ever done. I was contacted by Brett Spivey of Xochi Media on March 31st (a little over two weeks before the event) and invited to join their crew. I joined them in Encinitas a week later for rehearsal and mind-melding, which is when I started my Coachella VJ Blog. Our job was to be the House VJs – we would do visuals for anyone who didn’t already have something prepared. Spivey emailed all the performers to find out what they wanted, and the big guessing game began. Some groups got back to us right away, others didn’t respond until we were already setting up at the festival, and some never did. Of the groups that responded, some told us they wanted no visuals, some had a logo or an album cover, and others, like Groove Armada, provided us with Gigabytes of beautiful content we were to work from. For many groups, we had to guess – Shepard Fairey was easy since he’s also a visual artist and has plenty of prints we can animate, but for someone like Christopher Lawrence, we just listened to the music and organized groups of clips to work from. Numark NuVJ Stations – We had three of these, all of which had been set up with the same drive structure and VJ content (different sets of clips for each artist). Ed. : The NuVJ is hardware from Numark, powered by software from Arkaos. VJ Aquine’s Station – She used her custom Quartz Composer mixer and copies of the content from the NuVJ systems, along with a Korg NanoKontrol and NanoKeys replacing her usual M-Audio Ozonic. Camera Station – We had a handful of cheap security cameras on stage, and a handheld camera operated alternately by Bryant Place (Cyber Patrol Unit) and Derth Adams. These were all fed into a G5 tower (via a couple of Miglia Mac video capture cards) where they were mixed in a custom Quartz Composer [cdmo tag] patch, allowing control of up to 4 layers’ opacity, Brightness, Contrast, Zoom and X/Y Panning. VJ Server – during rehearsal and performance, we had a G5 running a Gigabit Ethernet network for us, allowing for easy transfer of clips and documents. When Groove Armada gave us some 15 Gigabytes worth of clips, we didn’t have to blink – put it on the server, and we’ll all pull what we need onto our own machines. 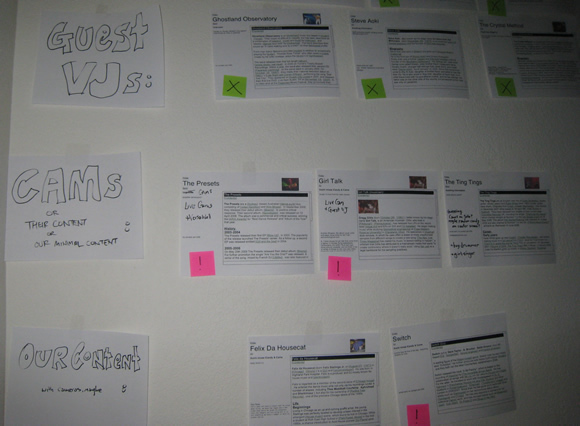 We had an agreed-upon directory structure so it was easy to move things in and out while keeping it all organized. Cables & Boxes – we had a couple of Barco ImagePro boxes to convert our signals to SDI so we can run them up to the High End DL3s in the rafters and the 12K projectors behind the stage. We also had hundreds and hundreds of feet of BNC cable, much of which was strung out and then buried in a trench running from our station to the stage. Tasso Okinawa did visuals for Gui Boratto on Friday and Supermayer on Sunday. He used a pair of MacBook Pros running VDMX. Eye Pscience threw beam for Steve Aoki on Friday and MSTRKRFT on Saturday (with Xochi on live cameras for both). On deck were VJ Victorious, Lucky, Sid Z and Michael Allen. On their table I spied some Pioneer DVJ-X1s, an Edirol CG-8, a Korg Kaptivator, and Edirol V-4, a Korg Entrancer and a couple of MacBook Pros. Andrew Strasser laid down the visuals for Girl Talk’s performance using a MacBook running Modul8. He definitely wins the award for most compact VJ setup. No controllers, no external drives, nothing but a consumer-grade laptop painted gold to match his outfit. The Crystal Method had their own visuals, which I presume were run by a gregarious man with a charming accent named Laurence (or Lawrence, or possibly Lord Ence, I never saw it spelled out). Martin Phillips, the Lighting Director for TRV$DJ-AM also ran their awesome visual setup. Thomas Traum did the visuals for M.A.N.D.Y. on behalf of Universal Everything.He used VDMX on a MacBook Pro, using TouchOSC on an iPhone for basic controls. All content was specially rendered 3d sequences created uniquely for M.A.N.D.Y.’s live set, which he mixed together on the fly. A stylish fellow we know only as ‘Boris’ setup up with his MacBook Pro and some FaderFox boxes to run visuals for Perry Farrell. Etienne De Crecy had their beautiful Exyzt Team-designed Cube. They were not interested in giving out information on their setup or having their picture taken. That leaves Xochi Media, which was VJ Spivey, VJ Aquine, VJ Metamer, Cyber Patrol Unit, Momo the Monster and Derth Adams running cameras and visuals for Groove Armada, Felix Da Housecat, The Ting Tings, The Presets, Christopher Lawrence, Shepard Fairey, Switch, Zizek Club, Drop the Lime, Para One, Surkin, Zane Lowe, the Bloody Beetroots, The Crookers, Marshall Barnes, Busy P., The Plump DJs and Late of the Pier.